We listen to our music on nanos, we style our hair with nanos, with the arrival of the Tata Nano people will even be driving nanos, but why are so many products called nano? This is a story of two nanos. Over the course of the last 12 months, the LexisNexis database of newspaper articles records 239 stories referring to nanotechnology in the British press. In the same period there have been 239 stories referring to "iPod" and "nano". On the one hand, there is considerable concern represented in the newspapers about the possibilities of nanotechnology. At the same time it has become a manufacturers' shorthand for things that are really, really small. As well as the obvious, the iPod Nano and its competitor the Creative Zen Nano, you have the Logitech nano mouse. In the world of haircare you have the Remington Nano Silver Groomer PG400 and the splendidly-titled Philips TRESemmé HP4669/17 Salon Shine Nano Diamond Digital Slim Straightener. The latter boasts "nano-diamond ultragliss ceramic plates". 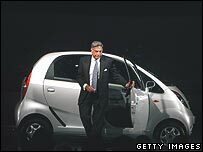 Now Tata of India has made a very cheap car that also happens to be very small, so it's the Nano. But what exactly is a nano? Once upon a time the Greeks used the word "nanos" to mean dwarf. This term was used in science in the 20th Century and in 1960 it was recognised when the term nanometre came into use, meaning a billionth of a metre. Crudely put, it could be thought of as about 10 atoms long. ...got to do with this? In 1959 the legendary physicist Richard Feynman gave a speech about the possibility of machines being used to build smaller machines which would in turn build smaller machines until you reached a near atomic scale of machine. He asked "Why cannot we write the entire 24 volumes of the Encyclopedia Brittanica on the head of a pin?" Feynman didn't use the term nano, but in 1974 Norio Taniguchi used the word "nanotechnology" to describe ultra-precision engineering. It is this meaning that attracts the technology marketers. If something has been designed on a near-atomic level then it must be a pretty nifty piece of kit. Sometimes there are genuinely nano-engineered components, but not always. And, as editor of Stuff Magazine Fraser Macdonald says, the naming of consumer technology is a business of outdoing the previous generation of gadgets. "A lot of it comes out of the fact that there're a lot more products available than 10 years ago. There's massive pressure to come up with product names that are exciting and dynamic. "For a while there were a few things called mini. 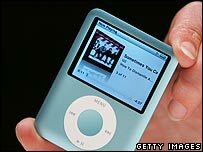 10-15 years ago people wouldn't have really known what the word nano was. Now nanotechnology isn't as dark and mysterious. They have come to assume it just means small." But it has certainly gone through dark and mysterious periods in the popular mind. In 1986, K Eric Drexler wrote Engines of Creation, popularising the idea of nanotechnology and also coining the famous "grey goo" term to address the possibility of nano-sized replicating robots multiplying exponentially to frightening numbers. 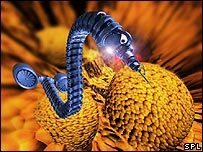 This scare scenario has proved a popular one in science fiction and the term has been widely used to describe fears over nanotechnology. Ottilia Saxl, chief executive of the Institute of Nanotechnology, says there is a geographic and cultural split over acceptance of the term, with the US and Germany often supportive while the UK is sceptical. "It is a cultural thing. In some countries nanotechnology is seen as providing benefits. "In the UK we are far more cautious. The UK product developers are sensitive. In Germany people think it's magical to have nano in their products." The uses of nanotechnology are now many and varied and tend not to involve self-replicating robots, Dr Saxl says. Much that is nano is now in chemistry. An example might be a self-cleaning window which uses a film that has been manipulated at a nano level to be hydrophilic (attracted to water) on one side so it sticks to the glass, while being hydrophobic on the other. Nano-textiles that have inherent water-repelling properties are now available. Nanotechnology opens up the possibility that one day most medicines will consist of particles engineered to target the ailment being treated, rather than being absorbed by many parts of the body unnecessarily. But the critics are worried that not enough is known about these engineered particles and what happens when they are ingested. 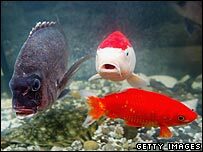 Prince Charles generated mass media interest in 2003 when he asked the Royal Society about the matter. The Institute of Nanotechnology is particularly keen to promote understanding of the use of nanotechnology in food. It's not hard to see why. Only this month, the Daily Mail ran the headline "ALERT OVER MARCH OF THE 'GREY GOO' FRANKENFOODS". To the casual observer it appears that nanotechnology in everyday objects frightens people much less than the prospect of actually ingesting nanotechnology. "It is going to be a long journey to convince people," Dr Saxl says. But it looks like the nano boast is here to stay in consumer technology. At least that is, until an MP3 manufacturer decides to call their product "pico" in reference to a trillionth. The femto, zepto and yocto are unlikely to follow. They just don't sound right. "Once upon a time the Greeks used the word "nanos" to mean dwarf." And we still do. We haven't gone away you know..
Rata Tata comes from a Gujarati Family. Gujarat being the western state of India has Gujarati its regional language. In Gujarati "Nano" means small. This can be another theory of naming the car Nano which means small car. Pico is already a well heard of name, if you are a young dinghy sailor. There is a small dinghy called a pico, but its not a trillionth of a metre long. So how small is a Vimto? Too late! There's already a (very good) tiny radio-controlled helicopter called the 'PicoZ', made by Silverlit Toys. Once the marketeers get hold of a word, it seems to get everywhere. I'll always think of the '80s as the 'turbo' decade. Personally, I find iEverything far more annoying. And yes, that includes the BBC iPlayer. It makes it sound like everything is made by Apple. You missed out atto. Which is also seeing ever increases in use. Writing as a researcher working on nanoscale devices, there seems to be a strong feeling in the scientific community that labelling your research as 'nano'-related will do wonders for your chances of securing funding. There are plenty of popular trends ('hot topics') in research; nanotechnology is the latest and its papularity seems to have spilled over into the commercial world. In actual fact, nanotechnology has been around for thousands of years. For example, colloidal gold was used by the Romans to stain glass!